Have you ever thought of communication as a gift? It’s so easy to take things for granted. But I am thankful for the reminder of the precious gift I open every time my daughter Emily and I interact with one another. 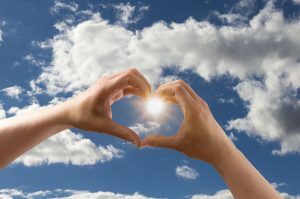 I hope my experience and thoughts shared here inspire thankfulness for simple things we all too often take for granted. May it also lead to more understanding of deafness and encourage learning to communicate with those who cannot hear. My younger daughter, Emily, and I were blessed with a lot of one-on-one time for many years. My older daughter went off to college a couple years after their father left, so it was just me and Emily for years. We’ve been through a lot together. When I remarried years later she gained brothers, another sister, and a step-dad. A houseful! But we still carved out “mother-daughter time.” She is grown and now lives in another state. Naturally, I miss her and our time together. I’m reminded of the lunch dates we used to have each week trying different restaurants in our new town. We talked about everything. We don’t always see eye-to-eye on things but I’m so thankful she felt comfortable asking me anything. Any topic. When I think about the hard road traveled just to be able to communicate, I realize that it truly is a gift on many levels. It makes me even more thankful. Sadly, we too often fail to communicate with others. Sometimes it is intentional. Other times it is not. But communication is vital. We must be intentional in doing our best to connect. Emily barely spoke when she was little. Many thought she was strong-willed or just never listened. I expressed concern to the pediatrician at each visit but was told that the second child usually does everything later. They thought her older sister was most likely communicating for her. Things I read said much the same. At her four-year-old check up they realized what I had been expressing to them for two years, just not the reason for it. The nurse said she would not cooperate for her hearing test so we were sent to an audiologist. Some days are forever a marker in life. It’s hard to forget the day someone gives you the news that your child cannot hear. We learned after an audiogram done at the initial visit that Emily is moderately to severely deaf. Shock. Disbelief. Fear. Loss. Guilt. Those are just a few of the emotions that washed over me instantly. They would continue to haunt me for a long time after that day. How could we miss something like that? After all, she says some words. She responds to some. This can’t be right! I insisted the test be done again. The following week the result was the same. My Emily could not hear. I sat dazed, trying to process the information. The audiologist gave options and prices for what was recommended to be most helpful for her to hear and learn to talk. Hearing aids. The high priced ones. And a system to feed a voice directly into the hearing aids. And if they did not work for her, a cochlear implant might be an option. I knew we did not have the money for any of it. All the while, I was having a conversation with God. The first scripture that came to my mind was Romans 10:17. One of the first thoughts and prayers I recall from that moment was… How will she know You, Lord? After the appointment I began to research. I read that Deaf people are he largest unreached people group in the world. My heart broke. The International Mission Board states, “The World Deaf Federation estimates that seventy million people are Deaf. Out of that population, 107 unengaged, unreached Deaf people groups have no access to the gospel and no knowledge of God’s grace.” Wow! If that interests and burdens you, I encourage you to click these links. Read this article: “The Deaf: An Unreached People Unlike Any Other” Also, take a look at an eye opening visual here. As my heart broke I was infused with hope and purpose. God desires to use this in her life somehow. I sought out any assistance I could find to obtain what she needed. Our insurance would not cover hearing aids. Most do not. The organizations I found that offered assistance only provided low grade hearing aids. She needed more help than they would provide. Despair attempted to set in. There’s got to be an answer and help for this child somewhere! All I could see was that we would need to learn sign language. We couldn’t afford the technology that would help her. I only knew I had to learn how to communicate and teach her. Free sign language videos from a Dept. of Education program started flowing through our house. 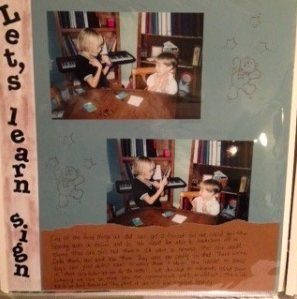 Learning to communicate with her through sign was a beginning. Our pastor called one day with surprising news that overwhelmed me with new emotions. During a weekly meeting several of the deacons brought up Emily’s situation with one thought, “We have to do something for this child.” He asked me if we would be okay if they gave people an opportunity to give. They called it “A Love Offering for Emily.” There are no words. Just deep emotion and tears. Even writing about it this many years later brings back such gratefulness it fills my heart and brings me to tears. Sometimes the heart just overflows and leaks from the eyes. Lest anyone think a man cannot be saved in his old age or while reading Genesis, meet Charlie Lively. He and his wife Christine, an amazing elderly couple, had lost a young child, their daughter, to cancer in their younger years. They had kept only a couple of her favorite toys as keepsakes. One was a “Chatty Cathy” doll. The other, a sock monkey. When they heard about Emily they sold the doll. It was then a collector’s item. Charlie also sold one of his guitars. They put that money in an envelope and put it inside a box with the sock monkey and a note that said, “To Emily.” Never had someone given such a gift to us! 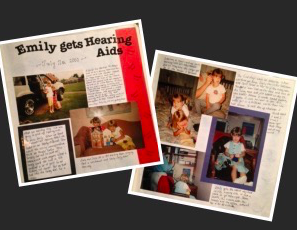 The money helped to provide for Emily’s needs beyond the hearing aids. But it merely passed through our hands. The example and the love they gave stays with me. It was a sacrificial gift. We still have the sock monkey. And yes, I kept the envelope. Covered in his own handwriting, it’s a precious reminder. They communicated sacrificial giving and sincere love. Oh, what a gift! We were able to get her hearing aids just 2 months after her diagnosis. I will never forget her reactions. The look on her face when she heard things for the first time. Priceless. They are ingrained in my mind. I only wish I had the technology then to record it for others to see. Every day held new discoveries. Voices. Music. The surprise that there is more to the TV than a picture. The cries and fear at the sound of running water from the faucet or the commode flushing. The vacuum cleaner… the doorbell… the cat’s meow. As amazingly wonderful as it was, it was also a long road with many challenges. It took a while to adjust. With all the new sounds, sometimes it was too much for Emily. She had been so used to the quiet. So, sometimes she would just remove them. I noticed her hearing aids missing after we got home from a game at the park one Sunday afternoon. I felt as if we lost her ears. Our friends from the area rescue squad and the church sent out a search party for her hearing aids. At night. In a field. In a large park. It was a real search party. Against all odds they found them! That’s when I decided she needed a haircut. I had to be able to more easily see when she removed them. It’s amazing how we accommodate just to be able to communicate. I realized I had already figured out ways to teach her things before knowing she couldn’t hear. Though she is an affectionate person, it turns out her desire to always be close to me was more than just for affection. She felt and heard more sounds and words when in very close range. I also concluded when she could see my face up close that she better understood me. We later realized she had actually been learning to read lips. And she still does! Emily utilized everything she could to communicate. She still does. This became an integral part of our life. We homeschooled and I had been thinking she possibly had a learning disability. I sensed she needed more help to learn language. So, I had looked for special needs linguistics curriculum even before we had her diagnosis. But we couldn’t afford what I found. But God knew. The speech therapist we were sent to was the coauthor of the very curriculum I wanted. Yes, God also provided Patty. I took Emily to see Patty two to three days a week for four years. Patty also gave me work to do with her at home and taught me how to help her. God is so good! Emily is truly a bright girl. We had years of language to catch up so we focused mainly on her language and speech. She fell behind in other subjects that would later become a challenge to her, but I believed if she grasped language she would be able to learn anything. We also had no idea if her hearing would continue to deteriorate and if we may have a limited window of time to obtain language. The speech therapist never thought Emily would do as well as she did. She had never worked with a homeschooler. But eventually she expressed excitement and great satisfaction. Emily says sounds that her tests say she doesn’t even hear. Patty attributed the success to the one-on-one interaction I was able to have with her, confessing Emily changed her view on homeschooling. She also agreed that Emily is a smart girl. All praise and glory to God. Most people don’t have to learn to listen the way Emily has. As I prayed about this I was led to 1 Kings 19 and reminded that it was not in the loud things that Elijah heard Him, but in something soft and gentle. I realized that though she could not audibly hear as well as most of us, Emily was a far better listener. Everything was quieter to her and she had to really listen and pay attention to truly hear. She is also sensitive and intuitive, noticing things others do not easily see. It’s as if her heart hears. It’s my prayer that those with deafness will see it as an opportunity to reach the Deaf, a community that is so often closed to people without deafness. In as much as deafness is a challenge, it holds a hidden gift. I began early on to tell Emily that God would use it for His glory. He already has! And He will continue to do so. I know it is difficult for her, but I think also of how gifted she is. She listens so intently and closely. Most of us have a hard time doing that. We also have a hard time getting quiet and shutting things out. I actually plug my ears at night to sleep. She just has to flip a switch or take her hearing aids out. And quietness is there for her. That can be a gift. Gifts often come wrapped in challenge and pain. One night we were talking about painful gifts. When I reminisced about my singing to my grandfather on his deathbed, she asked how I thought it so precious to sing as he passed away. She wondered how I could think it a gift. Until we spoke of her Mamaw. Emily remembered reading to her by her bed just a day or so before she passed away. She always worried Emily would not learn to read and even suggested I put her in a school for the Deaf. Yet Emily read Psalm 23 to her as she lay dying, shortly before she died. She read! And the passage was perfect. The look and the tears in her Mamaw’s eyes told us she understood, despite what the nurses told us. I know in my heart that was a precious gift she was able to give her Mamaw just days before passing. We did learn some. We kept up with the videos for a while. Then I asked a friend to teach us. We opened our home to whoever wanted to learn with us. It was important that she had a choice and could still communicate with technology if she chose. Emily even gave family members and friends a name sign. Oh, the audiologist was not happy and discouraged our using sign language. She thought if Emily could communicate another way she would never talk. I wanted her to have that choice, though. Besides, Emily talked endlessly. There was no way she would stop talking once she started. She was “Chatty Emily.” Sadly, the big group that came to learn dwindled with each week. The reality set in. Those she would be able to communicate should she not use hearing aids were diminishing. While we didn’t continue in depth with sign language, we have a foundation that we do use sometimes, especially when she decides not to wear her hearing aids. I confess that I sometimes get frustrated when I’m trying to talk to her and she has decided not to wear them. I have to remind myself how frustrating it can be for her, though, and be thankful for other ways to communicate. Those times renew in me a desire to learn more sign language. God has put people in her path who are studying sign language. I continue to encourage her to take courses in it as well. She has a unique opportunity for ministry. Good hearing aids can be a financial burden. They aren’t designed to last forever. Emily is already on her 3rd pair. She will have this added expense to plan for in the future. I could get on my soap box here. Insurance rarely covers hearing aids, yet they cover other things that are often results of bad choices. Emily didn’t make a choice to need hearing aids. The choice is to be able to communicate. I pray God will continue to provide for her… and continue to provide for each time she needs to repair or replace them. I also pray that she will have the other things she has desired; a home wired for a deaf person, and a service dog. She was on a list for a service dog but we never saw her name move up that list to receive one. Hearing Aid technology needs more funding for research and development. New hearing aids are another challenge for her each time, because the technology changes. Much of hearing aid technology piggybacks off of cell phone technology for financial reasons. There’s just a lack of funding for research and development for this technology. She has to learn how to listen all over again with each different technology. And it takes a while to get the settings right for whatever situation she is in. I know it is frustrating for her. As a child she had me to just take her for appointments. Now she has to take time from studies and work just to make things as audible to her as possible. Communication is a gift. The gift of audible communication has given us the ability to talk so openly. I am thankful for that. I am thankful for hearing the technology we have. I’m also thankful for sign language. And lip reading. Affection. And all the ways we have to communicate. Communication is a gift we get to unwrap everyday and make new discoveries and connections, and deepen relationships. Communication matters. 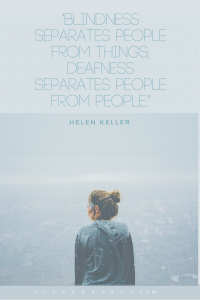 There are a lot of studies and statistics that show the physical, mental, and emotional challenges those with deafness and hearing loss face. Loneliness, isolation, depression, misunderstanding… the list goes on. I could write on several topics regarding this but I encourage you to research and reach out. Just imagine if you could not communicate with the majority of people around you. Even when an elderly person loses their hearing they are more lonely and feel disconnected. Emily is a remarkable young woman. Sweet, caring, fun, creative Emily has grown into a beautiful woman, inside and out. In college she faces new challenges to hear in large classrooms and noisy areas. But she has a lot of great things ahead of her. I’m praying personally that God will work in and through her for His glory. And that she will see it as a gift, even if in disguise as deafness. May it be embraced with joy overflowing. For she is fearfully and wonderfully made.